Rocket and Me: Life is Good! Two weeks ago I finally bought a truck. Not a new one, it is a 2004 Toyota Tacoma, but one in good condition and in a configuration I had been seeking. It is an XtraCab with the four cylinder engine and a five speed manual transmission. The windows go up and down by turning the crank by hand. The interior was well cared for, looking almost new. And the owner kept all of her service records in the 13 years of ownership. So far I have driven it over 700 miles and like it a lot. Last Saturday, I used it for what I bought it for, transporting a scooter. This was to retrieve my 1965 Lambretta Li125 from my friend Boris in Sanford, Florida. His house is 120 miles south so I took I-95 down but after seeing a crawling northbound traffic, came home on US17. He had repaired the scooter, so I tested it on the road for a few miles. The clutch finally works properly, fully releasing tension when pulled. I can now get it into first gear while stopped. But it wants to jump out of second and third gear. I will take it to ACE for fine tuning in the coming months. We loaded it into the truck and I headed home. Once back in Jacksonville, I offloaded in the driveway. Almost a disaster. Boris gave me two wooden ramps that he had as replacement for two I gave him years ago. These are shorter and the caps do not hold onto the tailgate very well. I began pushing it off, intending to use the front brake to slow the movement. I sat on it to get better balanced, then placed the rear wheel on the ramp. Gravity took it from there and the front brake did nothing to control the descent. We came very close to crashing onto the driveway. When down, I looked at the ramp and only maybe a half inch was still on the tailgate, so it could have collapsed while on it too. But we made it and I rode around the neighborhood in a light rain. At one intersection, where I had the right of way, a truck pulled to his stop sign, missed seeing me, and decided to head into my path. I hit the brakes and found that the rear brake works well, locking the rear wheel. But I controlled it well and he stopped before causing a mess. I now have a truck and the Lambretta back. Life is indeed good again! Boris, truck and Lambretta at his compound in Sanford. Back in the garage with it's cousin Rocket. Also, after getting a new top on the Miata last year, I finally got all of the mechanical demons repaired in the last couple of months. It had been leaking loads of oil onto the office garage floor, and smelling of oil after every ride. I took it to my friend Pablo's garage. He diagnosed that it needed oil seals replaced, but also a new water pump and timing belt. The shifter in the formerly slick six speed manual transmission had become a loose device, moving more than an inch in any of the gears. I had him look at this too and it needed new bushings and boots. So Pablo installed all of this, along with new spark plugs, oil, etc. It is now running better than ever. 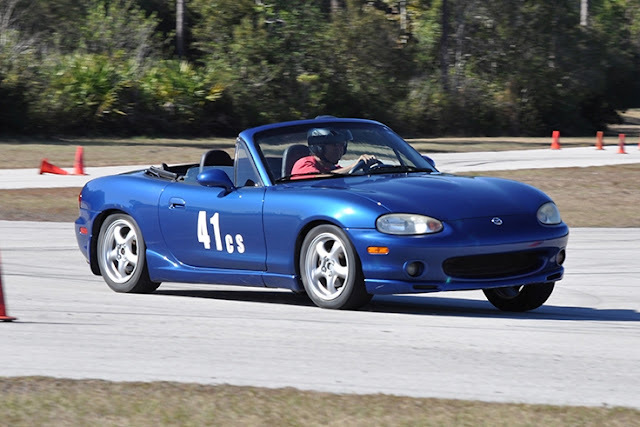 I can't wait to run an autocross in it, seeing if I still can keep up with the youngsters running now. And Fast Phil too. Time for an edit with so many things finally going well. For the past several weeks, I have been looking for my Spot, a device for locating me while out on a cross country scooter trip. It is very handy in using Dave Bednarski's Followride, a program that keeps track of all the participants in the Scooter Cannonball Run. Friends back home followed me and others last time, making it fun for them. I found it earlier this week! I have also been looking for the master keys for Rocket and Razzo. They were nowhere to be found. I looked in the house, office and garage. Nowhere. But today I was thinking, the last place I remember seeing them was in the bedside table that was next to the bed when we lived in the duplex. so I was about to ask for the key to the duplex when I spotted the table in the middle bedroom in the new house. I pulled open the drawer and there they were! The last worry that was resolved last week was permitting for a riverfront house I designed since the owner's old house flooded in Hurricane Irma. I finished the plans a several weeks ago. The contractor was finalizing pricing and got the plans into the building department a week ago. He got them back with comments that must be resolved before the permit is issued. I feared that I may have gotten the required setbacks wrong, or that the very complicated flood resistant foundation system may have been designed incorrectly. But the only questions were administrative and a demand that we add an electrical receptacle near the mechanical equipment outside. Now I can sleep better. I abandoned my pickup truck for a van before I got the scooter. If I take the mirrors off the GTS I can get it in the van. And our driveway has a ledge that allows me to back up to it and push the scooter in directly. My friend Paul often loads and unloads motorcycle on his truck with my "loading dock." But there are times I wish I still had the truck. No need to videotape the loading and unloading unless it's a FAIL. That's what YouTube is all about! I have only had the truck for a few weeks, but have already used it several times for “truck stuff”. I am wondering how I ever got along without one. I had thoughts of getting a van, but ended up with the Tacoma. I like it.